“I’m just going to enjoy this one,” said Oregon head coach Kelly Graves after his Ducks were forced to go overtime for the second straight game to beat the 10th-ranked UCLA Bruins 101-94 Monday night at Matthew Knight Arena. We’ll leave it future historians to make that determination but there is no doubt the win was big. 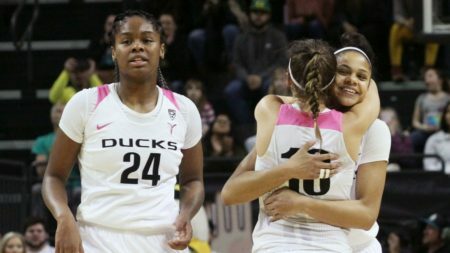 Entering the game with a one game lead in the conference standing over both Stanford and UCLA, with the victory the 8th-ranked Ducks put themselves on the doorstep of their first conference championship in 18 years. Oregon put together one of their best halves on both sides of the ball in the opening 20 minutes. Freshman forward Satou Sabally and junior point guard Maite Carzola combined to hit six of their first seven shots – five from behind the arc – to help the Ducks open up a 57-41 lead at the break. But the Bruins are too talented a team to go down without a fight and in the second half Jordin Canada and Monique Billings lived up to their reputations as two of the top players in the country. Each finished the night with 26 points and Billings added 10 rebounds as the Bruins fought their way back to take their first lead of the game at 90-87 with just over two minutes remaining. Ionescu hit a pair of free throws to cut the margin to one and then with 0:26 left in the game, hit the second of two free throws to knot the game at 90. The Bruins were able to get an open look for Lajahna Drummer on a baseline drive but the ball rimmed out and the teams headed to the overtime period. In the extra session, Ionescu hit three of six shots and the Ducks got a couple of defensive stops to put the game away. Sabally led the Ducks with 25 points, connecting on seven of her nine three point attempts on the night. Cazorla fought through a pair of injuries to contribute 24 including five of seven from distance, and Ionescu added 23, on six for sixteen from the floor and ten of twelve from the free throw line. On the night, Oregon made 35 of their 63 attempts from the floor (55.6%) and made 13 of their 25 three point attempts. The Bruins out rebounded the Ducks 32-30 and despite shooting 53.9% from the floor on 37 of 70, saw their season record slip to 21-6 overall and to 12-4 in the Pac-12. With two games remaining in the regular season – at Arizona State and at Arizona – at 25-4 and 14-2 the Ducks are a full game ahead of Stanford and two games ahead of Oregon State and UCLA in the race for the conference title. Following the game Oregon’s only two seniors Lexi Bando and Justine Hall were recognized for their contributions to the program.